Jillian Rooney readies a forehand shot. 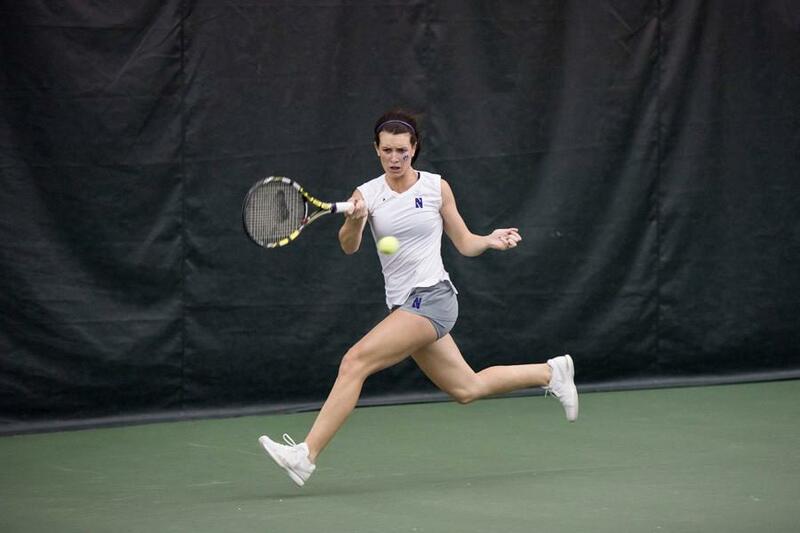 The junior has been a big part of Northwestern’s singles lineup in the last three games. Northwestern’s program is historic to say the least — the team has won many Big Ten Titles under the tutelage of coach Claire Pollard. With that, Pollard said she works her players hard and makes sure they understand what they are in for. Freshman Lee Or even called the practices tougher than her time in the Israeli military. Last season, the Wildcats did not fare well and were plagued by many costly injuries that cost them a chance at the Big Ten Title. This season, the team is fully healthy, but has struggled so far, unlike the previous starts under Pollard’s watch. For the first time since Pollard became coach, the Cats find themselves in a 1-4 rut, still spinning their wheels at the starting line while other, equal-caliber teams such as UCLA cruise by on the road to conference competition. Having a four-match losing streak may not be as bad as it seems, however, as this has been the toughest start for NU since 2009-10, and the Cats could easily be 3-2 right now instead of 1-4. The difference in the loss to then-No. 14 Duke to round out January was just one singles match, as three of the four singles losses went into a third set. This was seemingly the first sign NU could hang with top teams. Another example was Sunday’s 4-3 loss to No. 5 Vanderbilt when the deciding singles match between junior Jillian Rooney and the Commodores’ Fernanda Contreras went into a heated third set. The Cats have not taken the poor season opening lightly. Pollard has identified some intangible barriers the team still has to overcome in order to finish a point, game or match. Historically, NU has more or less lived and died by the doubles point. This year is much the same, with the Cats’ closest matches coming after winning the doubles point but being unable to win the later singles matches that would have closed out the victories. When NU loses the doubles point, the match ends in a large deficit for the Cats. The general consensus among NU is that it can play with the better teams, including defending NCAA Champion Vanderbilt. But in order to turn close losses into victories, the Cats understand they need to keep working on fundamentals.